There are so many options for removing unwanted hair and it can be overwhelming when deciding which is best from you. If you’re like me, you probably started roaming the drug store aisles as a teenager looking for hair removal alternatives to shaving. Most likely, you realized you don’t have the strength to wax yourself and those other products just don’t work. So, you keep on looking and stumble upon laser hair removal and waxing options. Though, we understand laser hair removal is not in everyone’s budget or will fit everyone’s lifestyle (however, it’s something we highly suggest looking into if your budget or lifestyle ever shifts to allow you to do so if you’re looking for longer lasting results), that’s where the second most cost-effective option comes in, known as waxing. If you’ve never had a wax and are interested in incorporating it into your wellness routine or simply want to learn more, then stay with me here. I sat down with AgeLess SPA’s nail and skin manager to give you four things you should know before your first or next wax. Yes, I said homework, but have no fear – it’s not calculus or anything (unless you’re into that then props to you). Prior to your wax appointment, hair growth on the area you want waxed should be about ¼- ½ “ long. You will typically see this length about two weeks after shaving, so plan accordingly and book a few weeks out in advance so the wax can catch the hair you want removed. Additionally, it’s important to exfoliate a couple days prior to your appointment to help with ingrown hairs and decrease the amount of bacteria and dead skin cells in the desired wax area. Lastly, it’s important to avoid retinoids and glycolic acids a week in advance because it thins the skin and makes the skin more prone to lifting (yes, we know, it may be hard to live without your IMAGE Skincare MD Retinol Cream for that long, but you can do it). I found this quite insightful as I never really knew the difference between hard and soft wax. Many service providers have a preference for the type of wax they use and with good reason. Our nail and skin manager prefers to use a lavender wax because lavender it’s soothing to the skin, making it a great option for sensitive skin and doesn’t leave a sticky residue. However, hard wax is great for sensitive skin and shorter coarse hair but doesn’t work well for fine hair (peach fuzz). You’re going to feel like a new person, maybe even like a beautiful naked mole rat (but in a good way), and feel liberated knowing you don’t have to worry about your unwanted hair growing back in an instant. However, it’s important to note results vary for each individual, but you will typically be ready for your next wax within four to six weeks. It all depends on the regrowth time and if you resisted the urge to use your razor during this time. Think of this homework as an assignment you would get for summer break, like a book essay, prior to the new school year, but way easier and less stressful. After your wax, you will need to avoid sun exposure 24-48 hours, so plan accordingly if you’re heading to a sunny place. You will also need to wear sunscreen since freshly waxed skin is more likely to burn (but we know you’re already doing that anyway, right?). Wax maintenance can easily fit into your schedule and self-care routine a couple times a week. You will need to exfoliate one to two times per week or use a topical product to prevent ingrown hairs (this varies on the individual, though), but it’s important to wait 24-48 hours to exfoliate as it will irritate your skin. If you don’t have a skincare routine already, it may be time to start making time for it. For example, my longer self-care routine involves more than just the daily cleansing and moisturizing. Every Sunday and Wednesday evening while I sip on some tea and unwind from the day, I do a more elaborate skin care routine, which involves exfoliating, use a masque, serums and retinol creams to maintain a nice glow. It’s important to make the maintenance process fun and something you enjoy doing. Even though, its referred to as “homework” above, make this the homework you enjoy doing. Find an effective exfoliant you look forward to using because of the smell and the way it makes your skin feel. Also, find an effective moisturizer that makes your soul and skin happy when you use it, as this will need to be used after each exfoliation. If you’re interested in a more elaborate skin care routine like mine, one of our estheticians can consult you on what would work best for your skin and lifestyle. Remember, do what works for you and your skin. When the time starts to roll around for your next wax, remember to complete the steps mentioned in the homework section above prior to any wax appointment. Now, you’re ready for a wax! There’s a good chance you didn’t realize you needed to do these things for a wax; I know I sure didn’t. I went years without knowing and dealing with ingrown hairs until I came to AgeLess SPA and was consulted by its educated team. However, this knowledge definitely made a difference in the way I take care of my skin, especially now that I am a regular when it comes to waxing. Want to schedule a wax at AgeLess SPA? Click here to inquire about an appointment in Horseheads, NY and here to inquire about an appointment in Nichols, NY. In staying in tune to all the crazy beauty trends, one of my absolute favorites is now eyelash extensions! Let’s face it, we live in a busy world, and there isn’t a woman out there who wouldn’t love to cut down on their morning routine. And if not having to apply eye makeup is an option, then count me in! When AgeLess SPA embarked on the journey to offering eyelash extensions, I didn’t know if it would be for me, but I was instantly convinced once I learned more about it. The thing that caught my attention was that for us t-shirt and jeans kind of gals on the weekend and wearing professional attire during the week, eyelash extensions are the “morning coffee and mascara” to both worlds; just without the need for mascara! Needless to say, I had to try them out. Now, for those who have been to AgeLess SPA, this type of service won’t exactly relate to the relaxing massage or facial services, but I’d be lying if I said that I haven’t been so relaxed that I fell asleep while having my lashes done. Between the warming bed, calming music, and the fact that I can’t be on my phone, it’s still some quality “me-time” that I don’t always make time for. So, how do eyelash extensions actually get applied? Literally, one by one, based on the look you’re trying to achieve. Each lash extension will get applied with lash glue, to one of your natural lashes (not your skin!). To say that Jess and Karen, our Novalash® Certified estheticians, have a keen attention to detail during the lash application process would be a huge understatement! Every set of lashes they’ve done looks so natural and fits the features on every client; it’s never overdone! But before you run (don’t walk) to us, it’s important to know if you are a long-term candidate for eyelash extensions. For every new lash client, a complimentary consultation is done to make sure that eyelash extensions are right for you. Jess and Karen, want to ensure that they get to know you and your lifestyle more before you jump right in. However, I went ahead a made a quick list just for you (but we will still require you to sit down with Jess or Karen for a consultation since everyone is different). Why might Eyelash Extensions not be a good idea for you? If you didn’t get scared off by the cons above, here are some pros! Another aspect that is taken into consideration when determining if eyelashes are a good fit for you is your natural eyelashes (surprisingly). Jess and Karen will evaluate if your natural lashes can carry the weight that comes with extensions. For example, if you have fine and thinner lashes, a lighter approach to applying lashes will take place. This is due to your natural lashes only being able to hold so much weight. However, those with already full lashes that might be looking for more of a longer or defined lash, your natural lash will be able to hold more extensions. If you decide to move forward with eyelash extensions, it’s important to note the maintenance that comes with them (it still takes less time than putting on mascara). In the spa environment, you’ll always hear us talk about the importance of cleansing your face every day, twice a day. This is especially important when you wear eyeliner or eyeshadow with your extensions, or simply wake up with those annoying eye crusties. With each application, you’ll receive an eyelash spoolie (aka disposable mascara applicator), which will be the only tool to use on your lashes. When it comes to cleaning your new beautiful lashes, use a very gentle cleanser and your spoolie to work into the lashes gently. It’s important to do this due to the makeup that can get built up at your eyelash follicle, which can wreak havoc on your eye area. If you’re like me and replaced your mascara with AgeLess SPA’s Lash Extension service, you can use the spoolie to help fluff your lashes each morning by lightly running it from the center to the tip of your lashes. Try to avoid getting the spoolie too close to your eyelid, as your extensions can get caught on the spoolie as they begin to grow out (trust me when I say, it hurts if you get the spoolie too close your eyelid!). All in all, before I had extensions applied, I didn’t understand what all of the hype was about. After one application of extensions, I fell in love! Mornings and I have never really gotten along, but I can’t tell you how nice it is to get up and go in the morning, knowing that all I needed was my moisturizer, foundation, a quick fluff of my lashes, and go! Now, about that coffee. . .
We were inspired by the ‘me too.’ movement and the article, 22 Brutally Honest Confessions From A Massage Therapist from Buzzfeed to shed light on what happens during a massage. We take great pride in the professionalism provided by our service providers and we expect the same from others who visit us for a massage or any other service. It’s time we educate others on what happens during a massage at our spa, increase awareness of the inappropriate behavior that may occur at other spas, but is not tolerated at AgeLess SPA, and protect our massage therapists from the inappropriate behavior. Massage may not be for everyone, but often times we hear reasons why people won’t get a massage, and we realize their reasons tend to stem from the lack of education of massages. One of the most common responses we hear is how people think they’re going to be touched. This is why it’s important to note every single one of our massage therapists completed an intensive massage curriculum and are licensed to treat pain related concerns. A massage therapist’s mission is to help improve your quality of life by preventing or decreasing pain using a variety of massage modalities; not give a “happy ending” (if you know what we mean). Additionally, based on the article from Buzzfeed, it’s clear some people perceive massage therapists as someone who would give them a “happy ending.” However, many of these occurrences are from the eyes of massage therapists across the pond where the culture is different, but we are aware it can happen anywhere. It’s not often one of our massage therapists experiences a client displaying inappropriate or suggestive behavior during a service, but in the event, it does occur, our massage therapists are expected to stop the massage the moment they realize a client is acting inappropriately, leave the room, and alert management. So, what happens during a professional full body massage by a licensed massage therapist at AgeLess SPA? First, your massage therapist will consult you on your needs (e.g., neck pain or lower back pain) privately in the massage room. After the consultation, they will step out of the room so you can undress to your level of comfort, and lay face down under the blanket on the massage table. It’s important to note that you stay under the blanket at all times except when your therapist is working on a certain area, like the back or legs, and will appropriately drape the blanket to expose those areas. After a few minutes of getting settled, your massage therapist will come back in to make sure you are comfortable, and the massage will begin. Typically massages start at your neck and end at your feet, featuring hot towels and/or heating pads, but it depends on what you talked about in the consultation and your massage therapist’s unique modalities. Most importantly, when getting a massage, you need to communicate with your therapist. They need to know if it’s too much pressure or not enough, and if you do or don’t like the particular modality they’re using, so don’t be afraid to kindly speak up at any point during the massage. You are in control of your body and they need to know your needs and feelings to make you feel relaxed and refreshed. This how you will get the most out of your time, money, and overall wellness experience. It’s our mission to give you the wellness experience you deserve, but we can guarantee you won’t find a “happy ending” here. However, if you’re looking for help with lower back pain, tension headaches, muscle soreness, relaxation, or anything else massage can help with, our licensed professionals will gladly assist you and work on helping you feel your best. At AgeLess SPA, we not only care about your overall wellness, but we also care about the overall wellness of the environment. That’s why we created our “AgeLess SPA Goes Green” program, which kicks off on Earth Day (April 22), in an effort to help eliminate waste in the environment. The best part? This is an opportunity for you to not only join in on our efforts but to save a little money! Simply bring in your empty Image Skincare bottles or containers to any AgeLess SPA location in the Finger Lakes region and you will receive 10% off the total of your next Image Skincare purchase. We will then take all of the bottles and containers and recycle them! 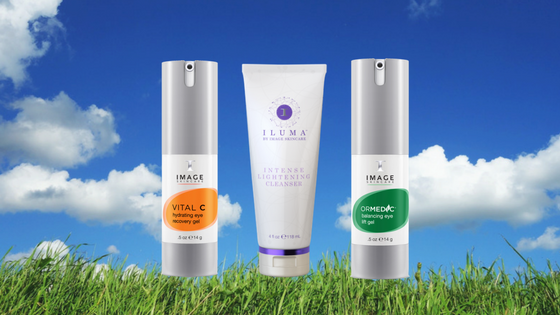 So if you love Image Skincare and the environment as much as we do, we encourage you to go green with us and bring in those Image Skincare bottles! Be sure to take a picture or selfie and tag us in it with #AgeLessSPAGoesGreen! We’ll be reposting your pictures! Ahh, it’s that time of year again where we spring forward and lose an hour of sleep, which makes it hard to adjust to our day. But what if we didn’t let Daylight Saving Time (DST) ruin our routine while we adjust to the time change where it feels like we never get back that hour of sleep until we set our clocks back in the fall? 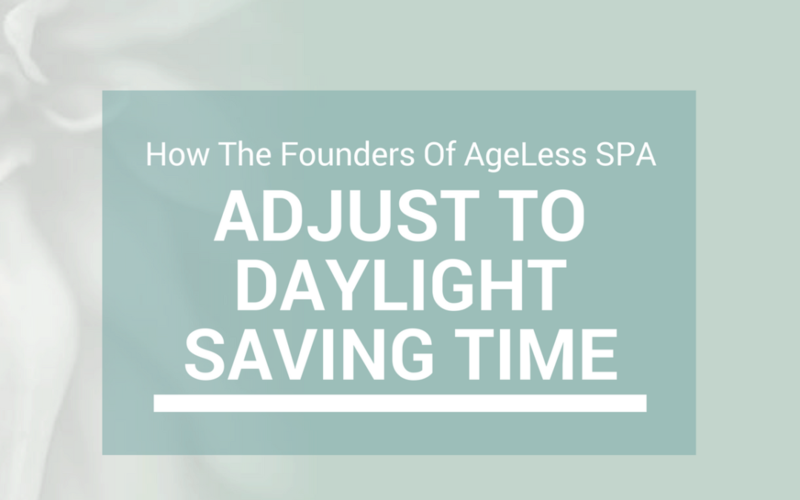 The founders, Michael and Michelle Cilip, of AgeLess SPA don’t let Daylight Saving Time affect them at all, though, and they can’t really have those kinds of hiccups with running a small business that is growing at an exceptional rate. So how exactly do they not let Daylight Saving Time get the best of them? The answer is quite simple. The Cilips follow a certain trick that they got from SomnoMed, which includes making a plan, regulating your sleep pattern, staying conscious of your physical activity, creating an environment to sleep in, and avoiding the clock when it’s time to sleep. Find out more details below on how the Cilips follow this simple trick! According to SomnoMed, the first step to do is plan on starting your adjustment to Daylight Saving the Saturday before Daylight Saving Time. This means to modify when you wake up and go to sleep by 15 minutes increments until Daylight Saving Time occurs. Once DST occurs, you will just have to wake up at your usual time or earlier, and already feel adjusted, as noted by SomnoMed. The second step to follow is regulating your sleep pattern, according to SomnoMed. It’s important to make sure you go to sleep and wake up at the same time every day, including weekends. SomnoMed also suggest taking a nap for at least 20 minutes if that is an option for you and does not affect your sleep pattern at night if you are feeling very tired and feel you need more sleep. The third step to follow is to have at least 30 minutes of moderate exercise, like walking outside when the sun is still out, about three times a week to help you sleep at night, according to SomnoMed. However, it’s important that this exercise takes place in the afternoon and not the evening before you go to sleep to not completely mess up your sleep pattern, according to SomnoMed. Lastly, we know this may be hard for some people who tend to look at the clock, but SomnoMed suggests avoiding the clock and if you are unable to sleep then pick up a book or journal (not your smartphone or electronic device) to help you relax your mind to help you sleep. The Cilips find this trick from SomoMed to be quite effective and they swear by it for when it’s time to start getting ready for a time change, so we hope this also helps you with your overall wellness needs! Find more in-depth details on ways to adjust to Daylight Saving Time from SomnoMed here. Please note: This post is from the archives of Samantha Schamel’s newsletter from 2016 and was edited slightly for AgeLess SPA. It almost feels as though it should be a holiday to do something good for yourself, right? So go for it! Maybe it’s that skinny latte or massage you’ve been meaning to get. Onward to our organ system! This article is all about the lungs or the metal element. In Chinese medicine it is said that the lung ‘open’ to the nose (hello, sinuses and bronchitis), the health of your lungs is reflected in your skin, grief/sadness is the emotion, and white is the color. If there is phlegm -due to poor diet or too much dairy- in the body the lungs are the receptical. Two diseases of the lungs that are most common are dryness and phlegm. Lung Dryness due to yin (substance) deficiency: dry chronic cough to the point of coughing up blood, shortness of breath, sore throat, dry skin, hot palms and soles, frequent thirst, flushed cheeks, periodic fever and could be due to chronic infection or inflammation of the lungs. Foods to nourish the lungs: PEARS 🍐! Particularly steamed Asian pears with a little honey. This works so well with anyone who has a dry cough! Also, oranges, peaches, tofu, tempeh, flaxseed, butter and other dairy, eggs, oysters, clams and pork. Phlegm in the lungs (typically a repletion that is possibly due to a deficiency: I mean think phlegm, thick or thin, productive to unproductive coughs, wheezing, asthma, shortness of breath if you have thick greasy tongue coating – you got phlegm! Food to help transform phlegm: fennel, fenugreek, cayenne, watercress, horseradish, garlic, fresh ginger, radish, and herb base the mullein leaf. Typically avoiding foods such as dairy, meats, tofu, tempeh, soy and all sweeteners. Another fun fact is the lungs and the large intestine are closely connected. So the next time you are bound up, try giving your nose a blow and see what happens!